Now it’s the Democrats’ turn. During their convention, they must make a case akin to a trial lawyer’s closing argument: Clear, strong and full of conviction. The most pressing question: Are you better off now than you were four years ago? This week The Washington Post reported that presidential candidate Mitt Romney bullied a classmate in high school. Romney issued two responses to the story; first, a denial via his spokesperson Andrea Saul, and second, in an interview on Fox Radio, in which he apologized for his behavior. The story has now shifted to the apology itself. People are skeptical. This is because it violates fundamental rules of verbal persuasion. Tongue-Tied America was featured in the March 13 Sunday edition of The Daily Progress, Charlottesville’s local newspaper. 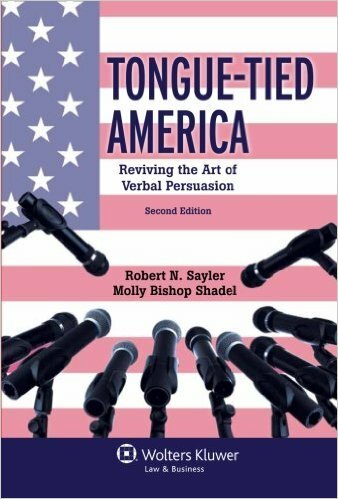 Professors Sayler and Shadel answer questions about why they wrote the book and the importance of public speaking, and they offer tips for people who are afraid to speak in public. The article appears on page A2 of the newspaper and is available online. Professor Shadel spoke today to the Insurance Law Forum of the Women’s Bar Association of the District of Columbia. The topic was effective communication skills for female lawyers. In her speech, titled “Advocacy and Gender: Women, Speech and Power,” Professor Shadel discussed gendered behaviors women may exhibit while speaking in public. More information can be found at the DC Bar web site. Professor Molly Shadel will be available for live Q&A after an encore presentation of a public speaking course she presented last October. The course, titled Public Speaking and Oral Advocacy: How To Do It Well! was originally presented live via webcast for ALI-ABA. The course qualifies for CLE credit. Visit the course page at ALI ABA to sign up.